It has been a while. I miss you. Good news is that it is all systems go again. This post is short and sweet but it feels like it is just right. Without going into too much detail, I have been busy looking after my father who has/had cancer. I say had because he is now doing well following a life saving operation to remove the tumor (with god’s grace and blessings). I also say has because cancer is one of those diseases that comes back and Drs. are still working hard to understand why and how to beat it once and for all. I wanted to share with you this amazing illustration, aptly named Death of a Tumor courtesy of E. Paul and Q. Paul, Echo Medical Media, and R. Gamble. 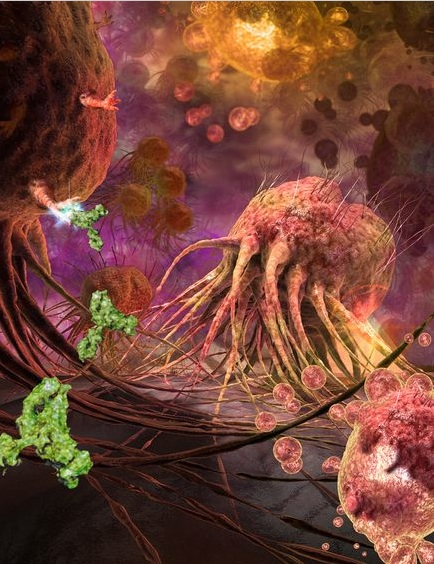 Green, T-shaped drug molecules fight “scary-looking, tentacled” breast cancer cells. The drug—called TRA-8—locks into the cancer cells’ “death receptors,” so that the cells eventually die. He used photos of real breast cancer cells showing how scientists are working on drugs to kill off only the cancer, leaving healthy cells alone. That’s all for now but I will be back soon. This entry was posted in Science In Art, Uncategorized by Faith In Geeks. Bookmark the permalink.